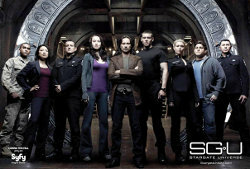 Stargate Universe (or SGU) is the latest original offering from Syfy. It takes place in the same universe as Stargate SG-1 and Stargate Atlantis, two shows I enjoy and complain about. (Not unlike the Star Trek franchise.) For me, SGU's predecessors suffered from a lack of gritty realism, where a team of only four soldiers could defeat an army of aliens who had superior technology. The Stargate series did have plenty of interesting characters and lots of action–two qualities sorely lacking in Star Trek–but the stories felt a bit shallow to me. Still, I'm always hungry for more scifi, so I knew I was going to give Stargate Universe a shot as soon as I had heard about it. My expectations were low … until I heard that this series would be driven by the characters instead of plot. Intrigued, I set my DVR to record the first episode as soon as it appeared on my program guide. Was it worth the seconds I spent hitting buttons on my remote, or was I shaking an angry fist at Syfy for wasting precious moments of my life?